Audio Toolbox™ enables you to interface with third-party speech-to-text APIs from MATLAB®. The third-party APIs require you to generate keys for identification purposes. To begin, download the extended Audio Toolbox functionality from File Exchange. Then follow the instructions for interfacing with your chosen third-party speech-to-text API. speechClient –– An object that specifies which third-party API to interface with, and additional properties that define the interface which are specific to the third-party API. 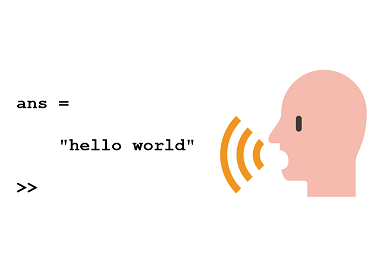 speech2text –– A function that takes as input an audio signal in MATLAB and returns text and additional information, as transcribed through the third-party interface. To interface with Google Speech from MATLAB, you must first create an account with Google Speech and generate an authorization key. The following steps describe how to create the authorization key. The steps are also described in the Google documentation. Navigate to the APIs & Services->Credentials panel in the Cloud Platform Console. Select Create credentials, then select API key from the drop-down menu. Click the Create button. A dialog box displays your newly created key. Name the JSON file Google_Credentials_Speech2text.json and save it to a secure location. You can specify the recognition configuration for the Google speech client by specifying name-value pairs during creation. For example, to create a speech object that tells the Google translate service that the input speech is Australian English, specify languageCode as 'en-AU'. By default, the language code is set to 'en-US'. The speechClient object does not perform input checks on the name-value pairs. Specify name-value pairs as described in the Google recognition configuration documentation. You cannot set the encoding or sampleRateHertz fields using speechClient. The encoding field is always set to FLAC, and sampleRateHertz is specified through the speech2text function. Call the speech2text function with a speechClient object, the speech you want to transcribe, and the sample rate. To interface with IBM Watson Speech from MATLAB, you must first create an account with IBM Bluemix and obtain a user name and password. The following steps describe how to create an account. The steps are also described in the IBM Documentation. Navigate to the Speech to Text service and sign up for a free Bluemix account or log in to your existing account. After you log in, enter speech-to-text-tutorial in the Service name field of the Speech to Text page. Click Create. Name the JSON file IBM_Credentials_Speech2text.json and save it to a secure location. You can specify the recognition configuration for the IBM speech client by specifying name-value pairs during creation. For example, to create a speech object that tells the IBM translate service that the input speech is English narrowband, specify model as 'en-US_NarrowbandModel'. By default, the language model is set to 'en-US_BroadbandModel'. The speechClient object does not perform input checks on the name-value pairs. Specify name-value pairs as described in the IBM Watson Speech to Text API reference. When you specify the sample rate using speech2text, the IBM translate service resamples the audio to the bandwidth specified by the model. The speech2text function outputs a table containing the transcript and confidence of the transcript. The output table can contain additional variables depending on the configuration of the transcriber. For example, if you create a transcriber that outputs multiple alternatives for each word, then an ALTERNATIVES variable is added to the text output. Create a new speech client, but this time use the default model (en-US_BroadbandModel) and set max_alternatives to two. The default model, en-US_BroadbandModel, performs much better than en-US_NarrowbandModel for the audio signal in this example. To interface with Microsoft Azure Speech from MATLAB, you must first create subscription keys. The following steps describe how to create an account. Navigate to the Cognitive Services and sign up for a free Azure account or log in to your existing account. After you log in, from the Cognitive Services page, click Speech APIs and then Get API Key for Bing Speech. Name the JSON file Microsoft_Credentials_Speech2text.json and save it to a secure location. You can specify the recognition configuration for the Microsoft speech client by specifying name-value pairs during creation. For example, to create a speech object that tells the Microsoft translate service that the input speech is a dictation, specify recognition as 'dictation'. By default, the language parameter is set to en-US, the format parameter is set to detailed, and the recognition parameter is set to Interactive. The speechClient object does not perform input checks on the name-value pairs. Specify name-value pairs as described in Get started with speech recognition by using the REST API. The speech2text function outputs a table containing the lexical, ITN, masked, and display form of the recognized text, and the confidence scores.